For our latest profile, meet Dane Nielsen. Dane is the Co-Founder/Head Brewer at Liars Bench Beer Company, a popular Portsmouth based brewery that prides themselves in walking to the beat of their own drum. Unlike most craft brewers, Liars Bench stays true to their hearts by dedicating themselves to beers with lower ABVs. Although their styles cover a wide range, they are determined to make more than just the beers that sell — they make the beers they love to brew. Read on to learn more about the blossoming 600-barrel-per-year brewery that brought together two old friends. NHM: How did you get into the brewing business/ what was your inspiration? DN: I started professionally brewing while I was in San Francisco. I spent six years brewing for both Trumer Brauerei and Magnolia Brewing, ending my time in the city as Lead Brewer at Magnolia's original pub on Haight Street. I was always initially drawn to brewing because of my dad, who would homebrew with me in high school. DN: New Hampshire was an easy choice for us. My partner at Liars Bench, Dagan, was my roommate at UNH for all four years there and he stayed in the area after school. It was him who called and lured me back to the seacoast of New Hampshire with the idea of starting a brewery. DN: I love pilsners and pale ales. Both are balanced and deliciously refreshing in their own right. At Trumer we made only one pilsner everyday and I loved it. Having a crisp pilsner is such a great way to end a shift. NHM: What's your personal favorite of the beers you make? DN: I am going to sound like a broken record here, but its No Dice, our pilsner. Knowing the process, the simple ingredients and the lengthy time it took to make, it's always a treat. DN: That continues to be a moving target. We are adding tanks throughout each year so our capacity continues to grow. We are hoping to hit 600 bbl this year. 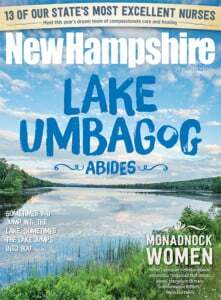 NHM: What sets you apart from other New Hampshire breweries? What's unique about your style or mission? DN: We are not seeking to follow any beer trends and like to make beers that are on the sessionable (lower ABV range) side of things. Our styles cover a wide range but are rooted in tradition. DN: We have eight taps and we do our best to update the website with current offerings. The beer menu is listed here. NHM: What's your most popular beer? DN: Young Upstart IPA is our flagship IPA and definitely sells faster than any other style. NHM: What's next for your brewery? Any expansions/changes or upcoming milestones or events to note? DN: We are always doing some sort of event, so following our social media accounts is definitely the best way to know what’s next. I'll take this opportunity to highlight the 4th of Ju'Liars party we are hosting on Saturday, July 7. There will be our second annual hot dog-eating contest, live music outside by Kong Moon and frosty mugs of our light American pilsner Bub Lite. We are also expanding into more space in the building where we're currently located. We'll be tripling our square footage and using that space to increase our barrel aging and cold storage. DN: There are quite a few restaurants and bars in the Portsmouth area that carry our beer on draft, but we also extend to the Dos Amigos in Concord. Other than that, it is all out of our tasting room in Portsmouth!